The Cessna 337 is a twin-engine aircraft built in a push-pull configuration. Instead of the engines being mounted on the wings, one is mounted on the nose and the other at the rear of the pod-style fuselage. The stabilizers are mounted on booms that extend from the wings. 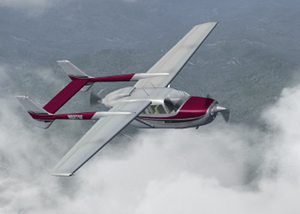 The Skymaster has a retractable undercarriage that gives it that little bit of extra speed. The combination of a tractor and a pusher engine produces a unique sound. The Cessna 337 Skymaster has a constant-speed propeller; so, you can increase propeller pitch to get more airspeed, but with a loss of engine RPM and power. Adjust mixture depending on flight altitude (for 5000ft or more). Check EGT for best mixture. The Cessna 337 still in development, but it has some suitable systems. Electrical, vacuum and fuel system are working, but they have no failure system modelled yet. Users can adjust the weight of each seat on the plane and fuel amount. Almost all buttons, knobs and levers are functional and properly animated, and all instruments are labeled for a properly identification. About knobs, use scroll mouse for gross adjustments, and left-central buttons for fine tunning. When setting radio frequencies, the mouse scroll will adjust integral numbers, and buttons will tune decimals. Try that method with instruments, cowl flap switches, trim levers, magnetos, etc. Note A full KMA24 audio panel implementation was added in January 2017. The knob on the right of the unit switches the speaker amplifier on and off and also controls the marker beacon receiver. To hear ATIS broadcasts, either switch the comm radio output using the COMM phone switch, or use the COMM speaker switch with the knob in any position other than off. To hear marker beacon idents, the knob must be in any other position than off and one of the MKR switches selected on the panel. The Cessna 337G Skymaster/Navomatic 400A autopilot has a fully working 3D panel and dialog. The ELT (Emergency Locator Transmitter) is a device which send a message in case of aircraft crash. That message contains info about aircraft model, owner and approximate coordinates of the crashed plane, and it is made to request SAR (Search and Rescue) services. 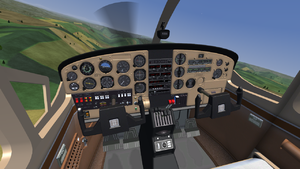 The Cessna Skymaster is the first plane equiped with a functional ELT on FlightGear. This page was last modified on 14 January 2017, at 09:27.